A couple years ago Lori came flying into the shop and yelled “Drop what you’re doing, you’ve gotta come down to the circle right now!” I did, as she explained… “The coolest Bluegrass band you’ve ever heard is playing in the circle!” By the time we walked down they were gone without a trace. A few months later these incredible musicians were playing at the Orange Farmer’s Market. Lori wasn’t with me but I was sure they were the same band. I bought a CD and confirmed they were. We like them so much we’ve purchased two more of their CDs. So watch BioLite video, (they let us use one of their songs fot it) then go read their story. Now the BioLite. If you don’t already know, the BioLite CampStove is a high tech portable camp stove that turns twigs into heat for cooking, and electricity for charging things like iPhones and running USB devices such as LED lights etc. I saw a post on FaceBook last year and had to have one. I got my pre-order in that night and had one in the first round of shipments. Not being a big camper, I postponed using it until I bought a tent. Since I haven’t figured out how to pitch the tent I bought, the BioLite sat idle…except when I took it out of its bag to show friends. 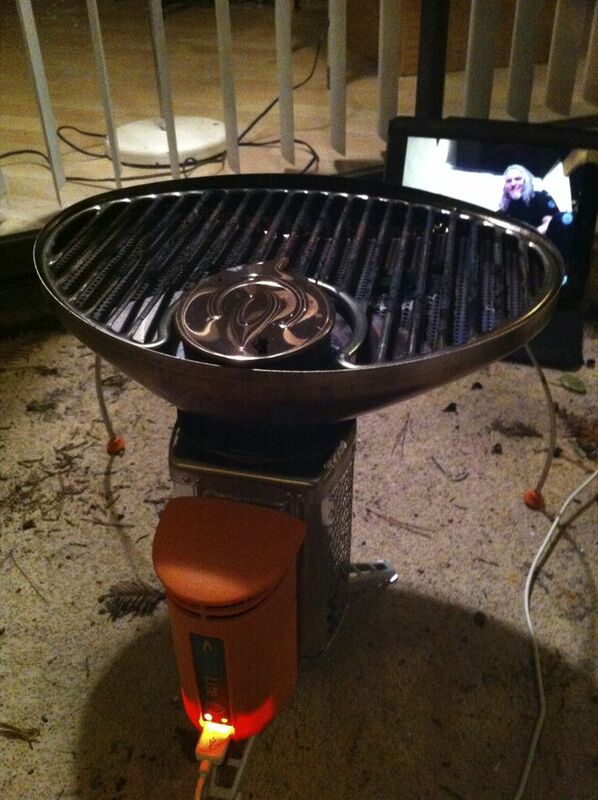 The BioLite people told me they were making a grill so I ordered it too. After awhile the curious began asking me how it worked so I figured it was time to make some tacos. The Biolite Camp Stove and Grill exceeded all my expectations. It heated a 6″ cast iron griddle to 400 degrees in about the same time as the gas stove in our kitchen. The grill distributed the heat very well…it gets less hot farther away from the heat source. I cooked two jalapenos, two Hatch Big Jim chiles, and about a pound of beef in about thirty minutes. It probably used a coffee can of wood. So does this mean we are camping in Monument Valley now that you have the BioLite and tent? Yes, but you get to carry the tent!